Get started with a free estimate! Curved & Bent Glass Shower Enclosures – Cool, But Can They Be Affordable? There is nothing quite as sleek, stylish and contemporary as a curved glass shower enclosure – but the question is can they be affordable? 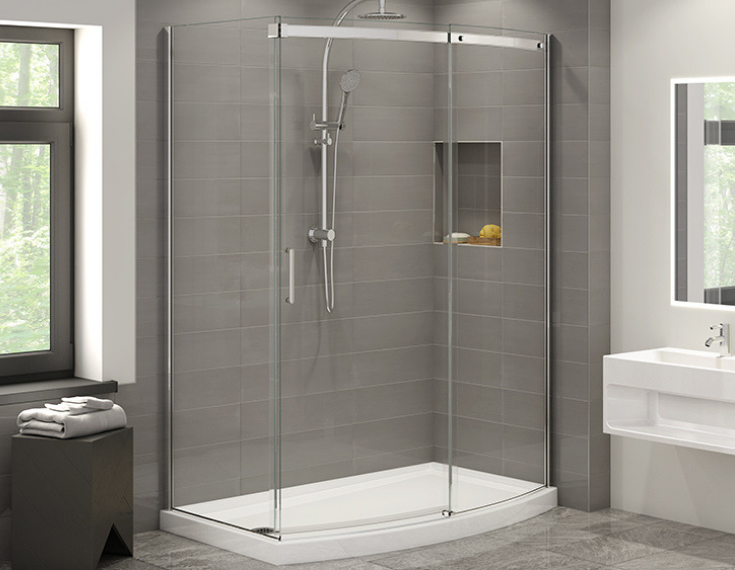 Learn below the benefits of these systems, the most popular types of curved glass showers, where they can be used and what are some of the more cost effective options. Maybe one of the most prominent advantages of curved glass is simply the elegance of the product. However, there are other benefits to consider as well. If you have a smaller bathroom a clear curved glass shower can give the feeling of a larger space. Another advantage is it’s ability to be designed to create walk in showers (these types of showers eliminate the need to clean around a door and are growing greatly in demand. 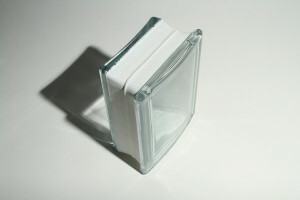 The most common bent glass products include single glazed units with safety tempered glass (the tempered glass is required for wet applications). Bent glass is available in different thicknesses, patterns and there are even low iron units to provide the maximum clarity. While this product can be customized to someone’s requirements – it is a pretty expensive option. One way to get the cost of curved glass down is to create standard shower base systems and then make the shaped glass in a production environment. Fleurco a company headquartered in Montreal Canada has developed such a product. First they created standard sized acrylic bases with curved shapes. The names of these bases are called – Arc, Round, Corner slice, corner wedge, Bowfront and Roman half-curved. Using these unique designs the manufacturer has then developed shower enclosures at various price levels – from moderate priced systems up to high end luxury showers. Glass blocks have come a long way! In the old days there were only square blocks that were generally used inside of window or wall openings. Today there are thinly shaped units available to create graceful curved wall. These thin shaped blocks are even available in clear patterns to show off tile or stone work on the inside of the shower. Flexibility is the word with the new era of curved showers. Whether you’re looking for a shower with a door or a walk in variety there is a cool looking selection available. These units can be put in “alcove” spaces (i.e. where they are surrounded with 3 interior walls – check out the Bowfront or Roman half curved units for a couple of examples), or in the corner of a room and are made to fit multiple sizes. You can choose from frameless shower glass or framed systems. What types of curved glass enclosures cost the least? Sometimes in remodeling or new construction projects are eyes go to what looks cool – but our hopes can get dashed when we get the price – ouch! If you’re looking for a cost effective curved enclosure that’s lighter on your budget check out curved glass systems which come in standard designs with shower bases to match. 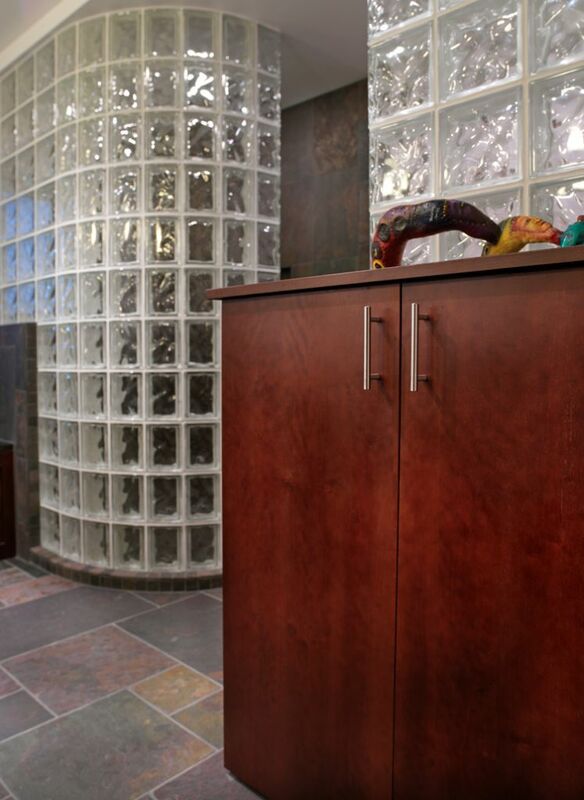 Another cost-effective option are radius glass block walls. They are usually significantly lower in price than custom bent glass. What questions or comments do you have about curved glass enclosures? If you need more input about these products – call us. We offer nationwide factory direct pricing and local bathroom remodeling service in Cleveland and Columbus Ohio. 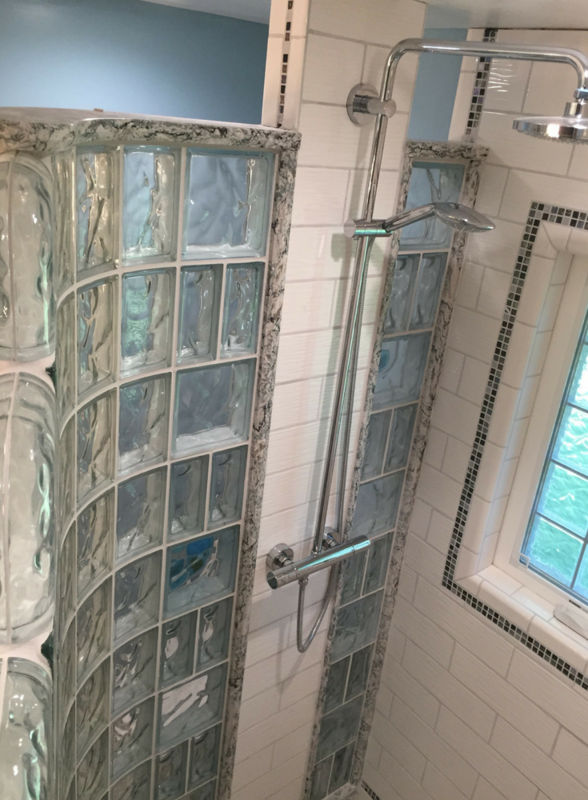 Contact Cleveland Design & Remodeling (216-658-1270) or the Bath Doctor in Columbus (614-252-7294) for design ideas and estimates on bathroom remodeling and curved glass enclosures. If you’re looking for a curved glass block shower or the standard curved enclosures get nationwide design and supply through Innovate Building Solutions (877-668-5888) or one of it’s local divisions including Cleveland Glass Block (216-531-6363), West Side Glass Block (216-398-1020), Columbus Glass Block (614-252-5888), or Mid America Glass Block. For complete remodeling services contact Cleveland Design & Remodeling (216-658-1270). This article was authored by Mike Foti. If you’re a remodeler or builder and want practical advice on remodeling products, industry trends, marketing and sales tips to grow your business (and cut day to day hassles), start reading my newest blog – Innovate Builders Blog. It’s packed with ideas you can use now. Click here to Sign Up for the Innovate Builders Blog. I would wish to talk about how to find shower doors for a tub with curved front. Do you sell such an item? Or, do you know who does? Thanks. Subscribe to our blog and get a free copy of our popular remodeling eGuide.